Reiko Beach gave her Digital Branding: You and Your Business for the United Regional Chamber of Commerce yesterday. Digital Technology has changed the way we communicate, the way we see the world, the way we live and the way we brand ourselves and our businesses. With the explosion of the Internet and social networks, Digital Branding is more important today than ever. In 1999 the Cluetrain Manisfesto predicted that the Internet would evolve to the point that the consumer would hold the power and traditional push marketing would become fairly ineffective. That’s where we are today. Reiko focused on how using some of the most popular digital branding tools such as Blogging, Facebook, LinkedIn, Pinterest and YouTube interact with each other to help you brand yourself and your business in the digital world. She covered some of the basic best practices for each and explain they are used for content marketing or promotion and how they are best used for you and your business. When using all these social media networks it’s important to understand what there major function is and how they work together to create your online brand. Strong digital branding consists of three main elements: 1. Consistent message across all platforms, 2. 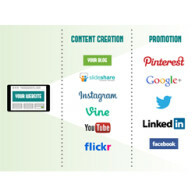 Uses three main areas, your website/blog, content creation social networks and promotional social media networks. Although most social networks have some elements of both creation and promotion, they are usually stronger in one area than the other. Digital Branding – You and Your Business from The Toolbox, Inc.